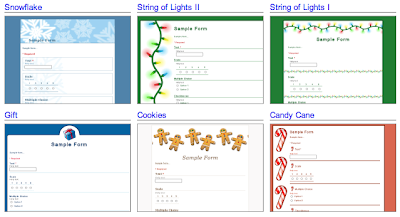 There are a lot of great holiday templates available in the Google Docs template gallery. Templates include holiday shopping lists, holiday newsletters, party invitations, RSVP forms and much more. Whether you are planning a recipe swap, family potluck, ski trip, a charity trip or need a party RSVP form, the new holiday themes in forms can also make this season a little brighter. To try out the holiday themes, create a form and the click "Theme: theme name" to see all the themes that are available. Real-time presence for presentations: now when editing a presentation with a co-editor, you can see which slides he or she is editing, and if you're on the same slide, you can see which element – text box, shape, image, video, etc -- is being edited. Sharing emails get a face-lift: More colorful emails and icons now indicate the type of document at-a-glance, better showcasing custom messages and making access even more simple. Sort by relevance: When searching your docs, results will now display the items most relevant to your search at the top of the list. Export all documents: We've also added an "Export all" option, which lets you export all your docs (up to 2GB at a time) with one click. This is the equivalent of almost 100,000 Google Docs. Change owner in a spreadsheet: A feature already available for documents and presentations, you can now change the owner of a spreadsheet. This is helpful if you are working in a group and the owner of the document leaves your group or no longer needs to work on that document. We hope you enjoy these holiday treats when using Google Docs this holiday season. And stay tuned for more helpful updates in 2010. The Google Docs team is celebrating the holidays in big ways this year. With nine launches in the last two weeks - and a gallery full of festive templates - there will be no shortage of cheer! These templates are excellent, and I will be using them. I also appreciate knowing of the other additions to the Google Docs, especially the ability to move documents in bulk.